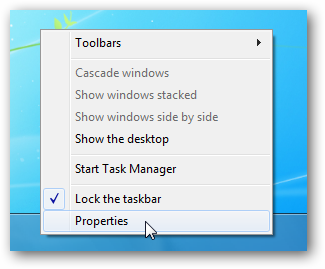 While many think the new taskbar feature in Windows 7 is a great improvement, others may not want to use it. Today we take a look at how to get the Vista style taskbar back on Windows 7. The new Windows 7 taskbar does take some getting used to for sure. However, if you need to get things done on your new OS quickly, you don’t have time to learn how it works. 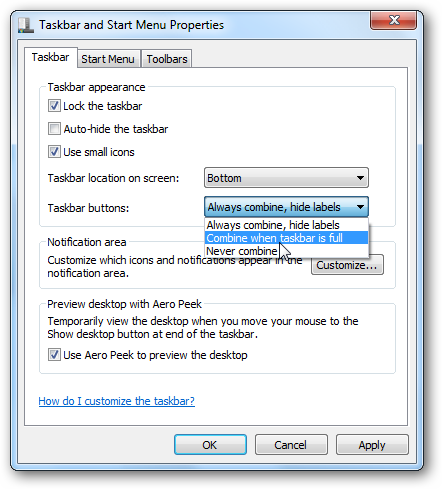 To get the Vista style taskbar back Right-click an open area on the Taskbar and select Properties. The Taskbar and Start Menu Properties windows opens up where you will want to click the box next to “Use small icons” and select “Combine when taskbar is full” from the drop down next to Taskbar buttons. Now the Taskbar look similar to how it did in Vista. It doesn’t look exactly the same but has similar functionality. Another tweak is to unpin all programs from the Windows 7 Taskbar. Then follow The Geek’s tutorial on adding the Quick Launch Bar in Windows 7 to get a look and feel that is exactly like Vista with the Quick Launch Bar enabled. This should help you out when you are too busy to sit and learn the new Windows 7 Taskbar or simply are not a fan of it.